Let’s face it, compared to other industries, healthcare adapts slowly to change. There might not be a clearer example of this reluctance to adapt than how healthcare has neglected text messaging as a viable method of communication. Text messaging, or SMS, is not a millennial thing—it’s a human thing. 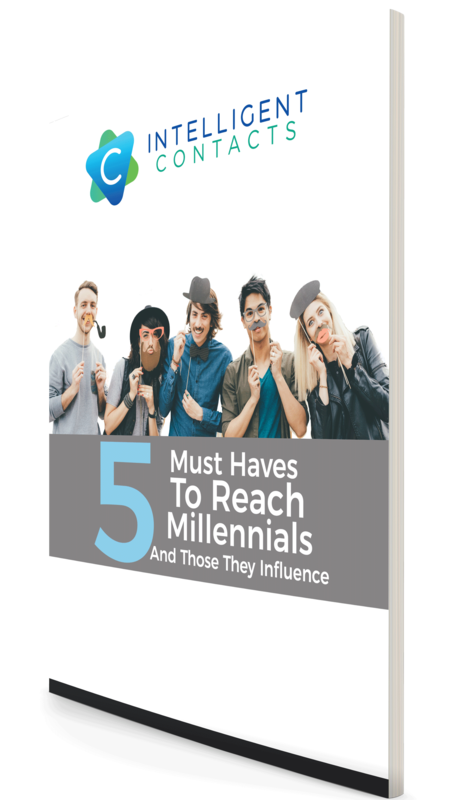 If you have any doubts about how widespread text messaging is across all age demographics check out 15 Statistics You Should Know About Text Messaging. Keeping these statistics in mind, it’s no longer a question of whether text messaging is a viable way for a business to reach its consumer. The better question is why hasn’t healthcare taken advantage of this direct communication channel to its patients? If you’re wondering how your office, hospital, or clinic can utilize this communication channel to become more efficient and effective, here are five ways to improve the patient experience through text messaging. Missed appointments can cost a single physician as much as $150,000 in lost revenue and additional labor costs. For clinics, the cost of patients forgetting about appointments could reach $1 million a year. 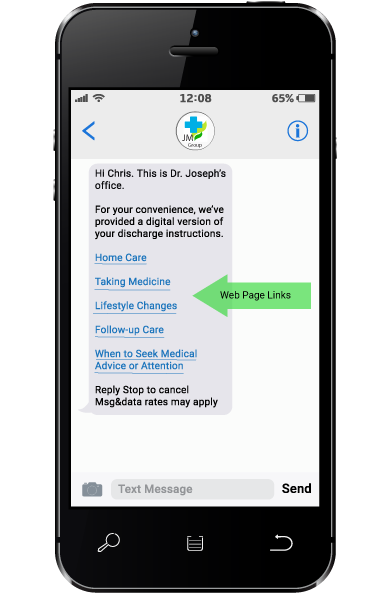 Since 95% of text messages are read within 3 minutes of being received, it’s a convenient and effective way to ensure patients don’t forget about their upcoming appointment. Using two-way messaging, a hospital or doctor’s office can instantly receive confirmation from the patient, or if the patient needs to cancel, update their physician’s schedule—all without picking up the phone. Simply load your reminder list, assign the text campaign, and let the SMS technology do the work. But what if the patient needs to reschedule? That’s not a problem either. According to US News & World Report, patients not following a doctor’s instructions wastes $300 Billion each year—with readmittance. Why do so many patients forgo thier doctor’s instructions once they get home? Robin DiMatteo, a psychology professor at the University of California—Riverside, has been studying patient non-adherence since the 1970s. According to him, instructions are often miscommunicated or misunderstood at the hospital or doctor’s office. People forget or misunderstand most of what doctors tell them, but they smile, nod and say thank you, and walk out of the office. “People forget or misunderstand most of what doctors tell them, but they smile, nod and say thank you, and walk out of the office,” says DiMatteo. In the hustle and bustle of a doctor’s visit or hospital stay, post-discharge paperwork can get lost and instructions become cloudy as the patient resumes the normal activities and routines of life. What if these important instructions were also sent as text reminders? It’s also possible to engage family members with these same text reminders. With so much emphasis on patient satisfaction and value-based healthcare, feedback has never been more important. However, getting patients to fill out forms after their visit can be challenging. 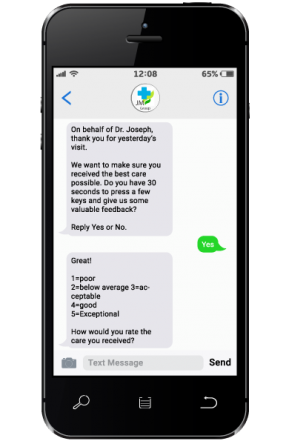 Simple text surveys can be completed in 60 seconds or less and provide immediate feedback about all aspects of the patient-provider experience. 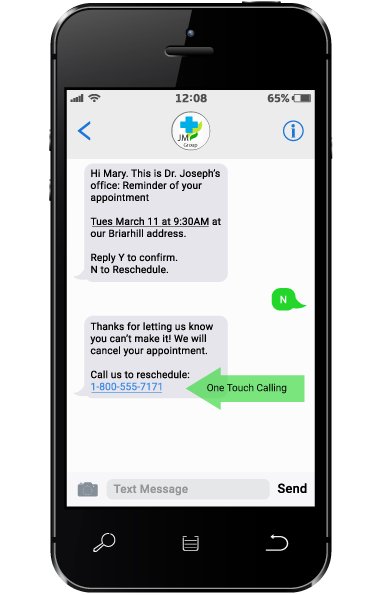 Whether it’s alerting a patient their lab results are in or an SMS reminder to your entire patient list to get their flu shots, text messaging offers the perfect blend of automation and personalization. How do you handle waiting lists? What happens when you have several same day cancellations? Don’t waste time calling your waiting list. Add the day’s waiting list to a group text and fill your openings in minutes with just one click. According to a recent Pew Research report, 77% of Americans own a smartphone. This means that over two-thirds of US adults can receive a text about a bill they owe and immediately make a payment from their cellphone.  In fact, 31% of online payments Intelligent Contacts processes are made from a mobile device! Pay-by-text is typically done in either of two ways: you send a brief text reminder of the bill and provide the patient a link to the payment site. Or, if you already have a payment method on file, you can ask the patient to authorize payment via text. 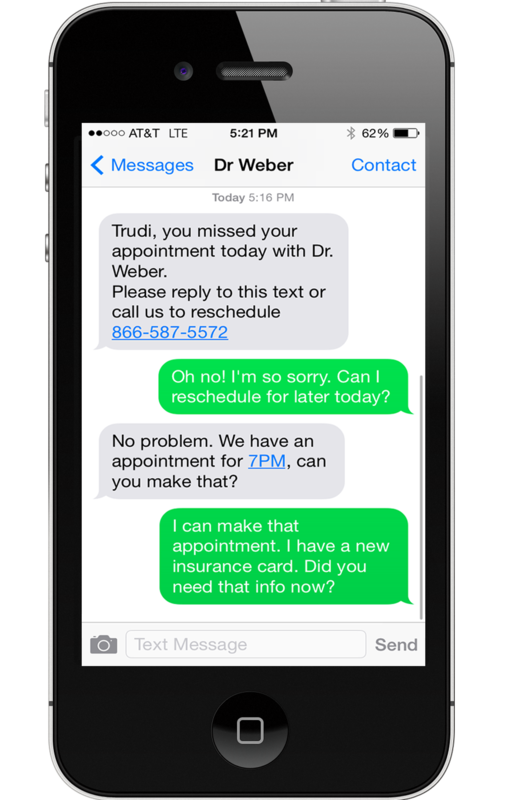 Need some examples of just how to use texting in the healthcare industry? 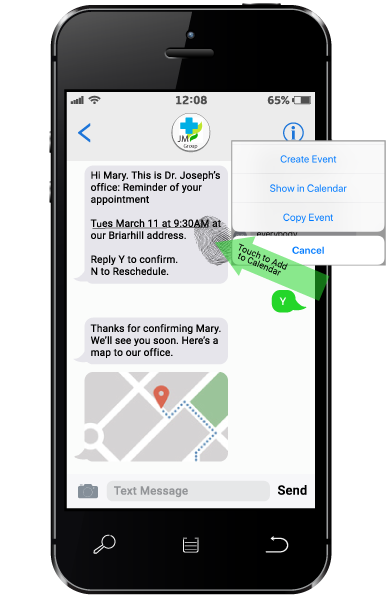 Check out the images below to see how appointment confirmation, reminders, rescheduling, follow-up, and feedback could work for you and your patients.